As per the information received by Mahesh Telecom, an Indian retailer, the phone is coming soon in India. Samsung has launched Galaxy J 7 and Galaxy J5 recently in the month of May 2016 which brought various new features in the current smartphones such as My Galaxy Apps, the Ultra data saving mode feature, and the S-Bike mode. Looking at its specifications, the phone comes with a 5.5-inch which constitutes of around 73.5% screen-to-body ratio, with full HD display of 1080×1920 pixel resolution i.e. approx. 401 PPI pixel density. The screen is protected with Corning Gorilla Glass 4 layer. The all new phone has a primary camera and a secondary camera of 13MP and 8MP respectively with a f/1.9 aperture. The front 8MP camera has the features such as beauty modes, wide-angle shots ability, and swiping the selfies with hand movements. It supports 1080p@30fps videos. It has autofocus and LED flash with both the cameras along with features such as face detection, panorama, HDR, geo-tagging, and touch focus. The phone has a Dual Sim functionality. The device has a 1.6GHz Cortex-A53 octa-core processor paired with 3GB of RAM. The phone has the 32GB internal memory which can be further expanded to 256GB by mircoSD card slot with 3300 mAh Li-Ion non-removable battery. The phone supports Android operating system v6.0.1 (Marshmallow). The phone is in two color option- Black and Gold. It supports various sensors such as Fingerprint, Proximity, accelerometer, and compass.The device also supports all sort of communications including Wifi Direct and Hotspot, Bluetooth v4.1, GPS with microUSB v2.0. The device does not support Java. It provides to the customers with Xvid/DivX/MP4/H.265 player, MP3/WAV/eAAC+/FLAC player, nd ANT+ support. Overall the phone exhibits a good combo of all the features at a decent price. 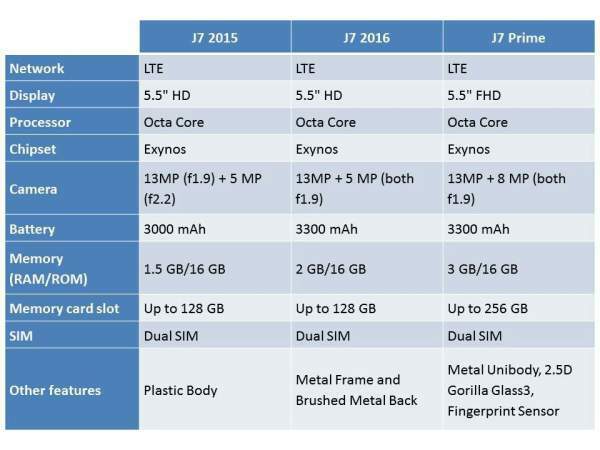 As compared to the Galaxy J7, the new J7 prime is much improved and a better option. Previous articleYeh Rishta Kya Kehlata Hai 7th September 2016 full episode updates: Akshara to expose drug racket?